Join us in celebrating a tattoo tradition! Friday, February 13th from 2-10pm at our Greenville Avenue location. 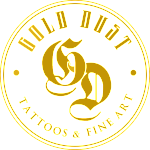 $13.00 tattoos + a $7.00 lucky tip. We have several artists and designs to choose from. See you Friday!